In that time, I have written 120 articles, totalling 526,216 words, and over the summer I surpassed over half-a-million readers. I’m not normally one to pay much mind to those sorts of statistics, but for this site’s fifth birthday I thought it would be interesting to see just how far I’ve come in that time and it’s been truly humbling. So I reached out – through the hallowed, transdimensional halls of the Domain – to 343 Industries’ own Jeff Easterling, to ask if he would be down to do an interview. With appropriate humility, I plied this oracle of Halo lore with questions, and he, with clarity and grace, answered. I want to preface this by saying thank you. Whether this is the first article of mine you’ve read, or the one-hundred-and-twentieth, or anything in-between, thank you for your time and readership – it means absolutely everything! 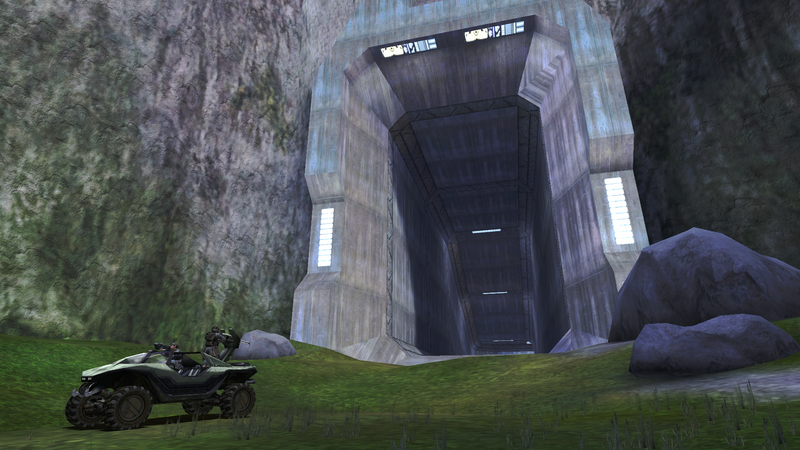 Secondly: Throughout this article, you may note that there are quite a few screenshots of Halo 1. That is because 343’s latest update for Halo: The Master Chief Collection patched in the Blind Skull (which Grim says I can take at least 7% of the credit for! 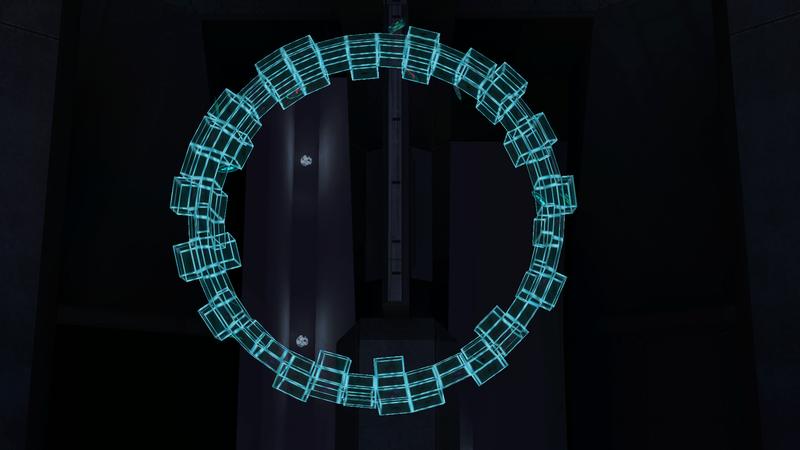 ), meaning that what I like to call a ‘photography run’ of the original Halo game is now possible. It’s something I’ve been clamouring to have for ages, given that Theatre mode obviously isn’t viable, and I’m so grateful to the people working tirelessly behind the scenes to make this product the best it can be. With that all said, let’s get to the good stuff! 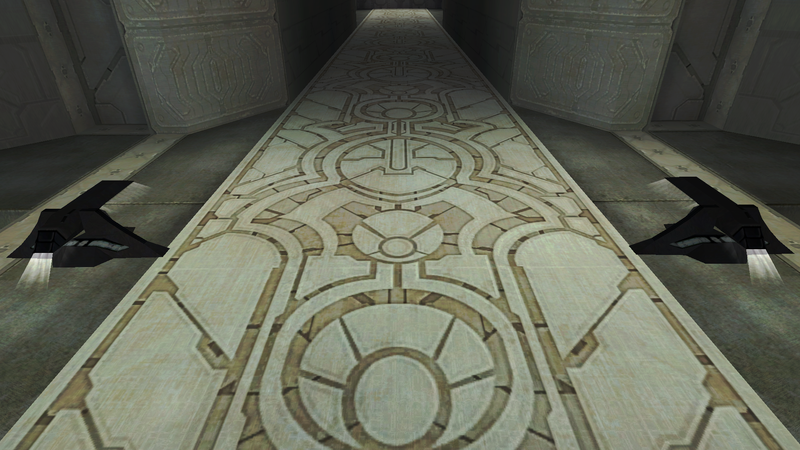 This document is a translation of a string of Forerunner data, converted to text. 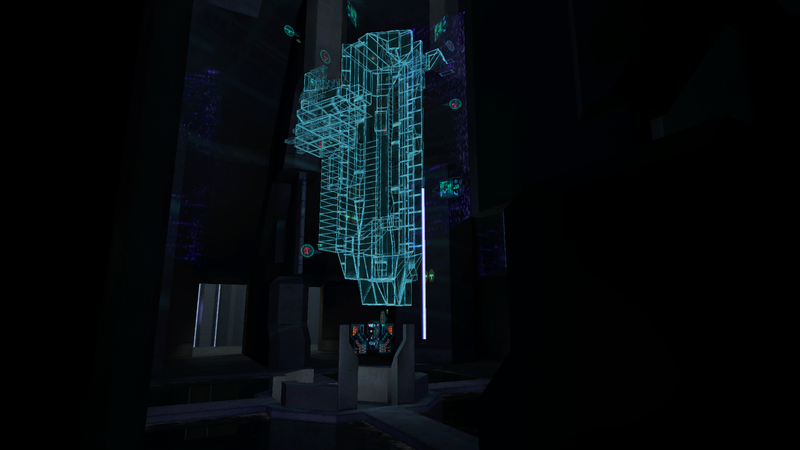 It has been abstracted from two sources: a Domain node terminal located here, Shield World 0006 (“Sarcophagus”), and a hitherto unidentified type of Sentinel recovered from the debris of Installation 04 (“Alpha Halo”) that was linked to said terminal. The Sentinel appears to have been intended to serve as a type of probe, examining and recording data on its installation before relaying it to other [Domini magni momenti locis]. Encoded within the images we pulled from the Sentinel unit is some startling data. While it is known that Forerunner information degrades over time without a link to the Domain, and is therefore suspect in one sense or another, I highly recommend we get someone on this. Contained within is information vital to understanding our past, our present… and, quite possibly, our future. You are, of course, somebody who needs no introduction… but let’s go ahead and do one anyway, for the uninitiated and for those who would like to be reminded of all the awesome content you work on. Who are you and what is your job at 343 Industries? I’m a writer at 343 Industries for Halo and play roles on both sides of the public-facing fence. What most people see on the outside is the work I do with our incredible Community team – writing and producing content like Canon Fodder, Community Updates, Community Spotlights, new consumer product features, esports content like event previews and recaps, and of course hosting things like some of our livestreams and other audio/video content. The behind the scenes aspect of my job sees me working with the Franchise team helping both create and curate new and old canon, working with other internal teams like art, narrative, design, consumer products, etc on supporting their universe-related needs, as well as supporting outside partners such as authors working on new novels (as an example). Having been at 343 for some years now, what would you say a typical day as one of the stewards of the Halo franchise entails? Oh man, I always dread that question, as “typical days” around here are often anything but. Really it depends on what is going on at the time. There are of course regularly-occurring staples like Community Updates, esports content, streams, and such, but much of what I do is specifically tailored around particular beats and events we have going on at the time. For example, leading up to and surrounding something like E3, or the launch of Halo: Fireteam Raven, or an event like PAX or RTX or the Halo World Championship – each of these things require dedicated attention to specific elements of their respective reveals, releases, and rollouts. I think another cool element of what I get to do are the smaller things that pop up, like helping work on things like figures from Funko or Loot Crate, as well as supporting partner projects like the Warthog in the Forza series or the Arbiter character in Killer Instinct. It’s honestly almost impossible to try and capture it all, which is also some of what I love about it. Has it been everything you imagined it’d be? What would you say you enjoy most about your particular job? In many ways it’s everything and more – though I’m not sure if I could have ever accurately “imagined” what it would be like. I’m constantly humbled by all of the things I’ve yet to learn, and even more so in being surrounded by all the folks who seem to already know it. This place – like many other studios of similar ilk – is filled to the brim with incredible people who are far more talented than they’re ever given credit for, and in so many diverse ways. I can’t express what a blessing it is to be surrounded by people of all walks, origins, and backgrounds, all who share a passion for both Halo and simply for making cool stuff for everyone to play, experience, read, etc. As much as I love Halo itself, it’s unquestionably the people I get to work with and for that bring me the most joy and fulfillment. Whether it’s my teammates across several different disciplines here at the studio, or the community itself that we adore and strive so desperately to please, it’s the people that primarily power my passions. I imagine it must’ve been quite a journey to get to this point. Can you tell us a bit about some of the other things you’ve done along the way? The GrimBrother One origin story? Are you sure? I’ve taken some bizarre pathways to get here lol. I think at the core, a strong foundation of family and faith and friendships have provided the best of beginnings. I was homeschooled (which made me super anti-social, obviously) and the oldest of a fireteam of five (four brothers, one sister), and these elements of my upbringing provided a ton of opportunities for learning to cooperate, empathize, and also to forge ahead, try new things, and cultivate a passion for both learning and sharing what you’ve learned with others. On the professional side, I spent nearly twenty years (from 1995-2014) writing, developing, producing, and performing science-based entertainment programming for a big science center (MOSI) in Tampa, FL. That experience alone opened up a host of opportunities itself, from helping NASA develop the educational curriculum for the International Space Station to helping design exhibits and interactive programming to be experienced by everyone from toddlers to seniors. Along the way I also wrote similar programs for the Florida Aquarium for seven years, did a habitat restoration and helped open an educational life lab at a natural spring site, and spent fourteen years working in various capacities in the racing/motorsports industry in series like the ALMS, Rolex Series, and IMSA. So, pretty ho-hum existence overall before Halo I suppose. 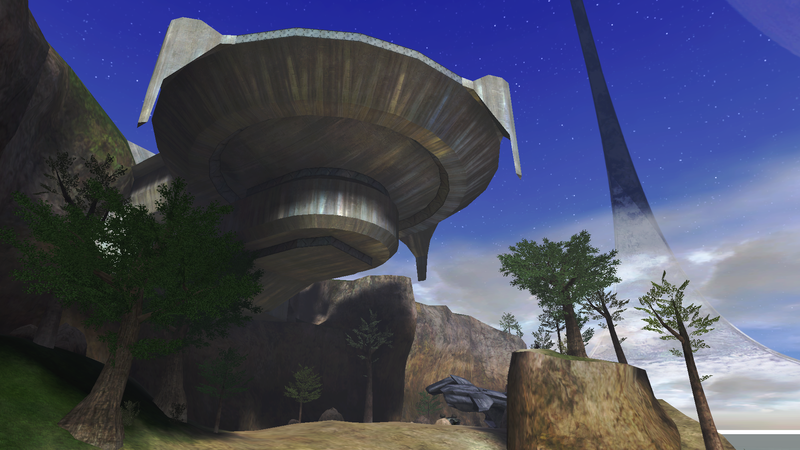 What’s your first memory of Halo and what was it that really drew you into the series? First real memory – aside from seeing rumblings about the game from various conferences and gaming magazine articles – was my good friend and roommate at the time bringing home an Xbox and me playing the Halo demo about a gazillion times. I think I went and pretty immediately purchased the full game and then got an Xbox for myself shortly thereafter. As far as drawing me into the series, I think the most obvious and unsurprising answer was the story and overall universe. I’m a sucker for diving into the details of enthralling universes (surprise surprise), and have always been interested in deciphering the ‘canon’ of my favorite franchises. Even as a kid, with Dino-Riders, Transformers, M.A.S.K., Power Rangers, Ninja Turtles, GI Joe, and more, I was always trying to ‘organize’ and ‘figure out’ the universe in my own head, and Halo immediately struck me as a world ripe for further such exploration, but now on a much more interactive and involved scale. It’s funny because I still occasionally stumble across old posts from when you were a fan. I saw one the other day of you asking Frank O’Connor about Halo: Legends and whether we’ll see the Chief again as far back as 2009! Now you’re one of the creative minds behind this universe. How would you say your perspective on Halo has shifted in that time? Well for starters, I’m still pushing for another Halo: Legends anthology, I’ll tell you that much! Kidding/not kidding aside, I think one of the biggest changes is actually just that: perspective. I was under no grand delusions heading into this that any of it was “easy” or “simple” by any means, but I still spent at least my first six months in awe of all of the things I hadn’t taken into account, and all the various reasons for why things happen and the hoops things have to jump through to make it out into the wild. Another thing that changed naturally was the sense of responsibility, and the suddenly terrifying prospect of stuff you help work on being dissected and summarily judged by the community you adore (and came from!). I’ve used the example several times before, but it works so I’m just gonna stick with it – I liken it most to something like Christmas/Birthday/Holiday gifts. When you’re a kid, you might think that getting gifts for some celebratory holiday is the greatest thing/feeling in the world… until you get older and begin buying/making/procuring gifts yourself to give to your own kids/family/friends. Now all of a sudden, you already know what’s in the box; you’ve already been “spoiled” on the ending so to speak, but now, your greatest joys – and greatest anxieties – come from waiting for others to in essence unwrap what you’ve given them, and waiting with bated breath to see if they’ll love it as much you hope they do. The responsibility is huge, but admittedly so is the potential payoff. It’s awesome. It’s terrifying. But mostly awesome. One of the most notable ways Halo has evolved over the years is in the way it’s become a transmedia juggernaut, one of the most successful sort of experiments to see just how far this franchise can go. What do you think makes Halo different in that regard? Why is it so successful? I think part of it is the fact that the universe has room for so many different types of stories – from grand epic space opera moments down to more intimate character pieces, and from a variety of different perspectives, backgrounds, settings, etc. Another thing is that Halo fits so well with so many different visual mediums – some probably better than others, of course, but it’s still a universe that’s incredibly and impressively versatile overall. I love that you love Halo: Nightfall lol – and trust me, Kiki [Wolfkill] loves that you love it, too. And actually, some of my favorite pieces of off-the-beaten-path media also come from the Nightfall family – specifically the Second Stories. They were actually something I got to help out with a bit, working alongside the incomparable Dan Chosich. I helped write some ancillary background fiction pieces for it, from character backstories to text that actually appears on datapads and screens in the stories, but are hard to make out in-story (some of that text we revealed back in Canon Fodder Issue 13). I also wrote some dialogue and provided voiceover work for one of the episodes (can you guess which one? 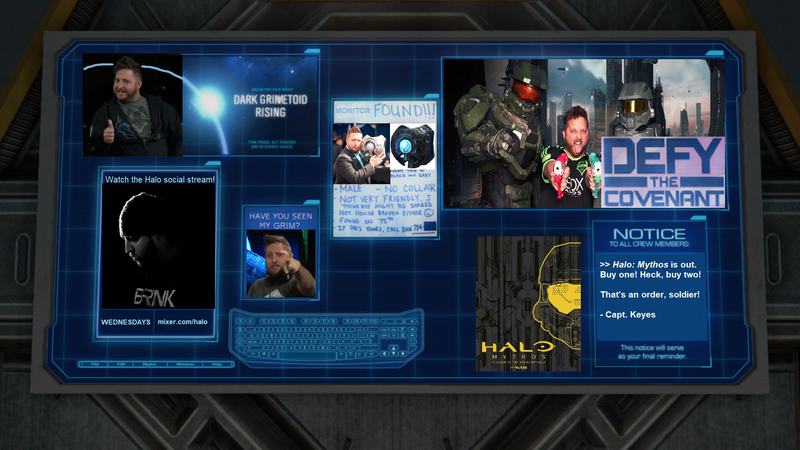 ), so that’s always a super fun and fond memory, especially considering how early it was in my tenure at 343 overall. I also love the Halo motion comics, thinking particularly about the ones based off stories from Halo: Evolutions (still wish we could have done one on ‘Human Weakness’), and also adore the Halo: Hunt the Truth audio drama series. Hunt the Truth took not just the Halo community by storm but I think the video game world as a whole really felt its presence and impact. I think that goes back to talking in general about Halo’s overall versatility as a universe. There are some really interesting storytelling mediums being experimented with right now all across the industry, as well as some “old-school” avenues that are coming back into vogue, such as the old audio drama format, which the aforementioned Hunt the Truth is a shining example of. And with things like the Halo TV show that will get to take its own path and tell its own stories, the next few years stand to be another really exciting time for fans of the universe in all its forms. We’re at the point now where we’re coming up to there being almost thirty novels out there, amongst a plethora of other story content. It’s an incredible achievement but also presents quite a challenge for the series going forward – it can look terribly daunting to look at just how much media there is. How do you think that’s changed 343’s approach (if at all) to telling stories in this format? I think it absolutely has affected our approach in different ways, but to be honest that’s also just part of the natural reevaluation process that constantly occurs when trying to help steer a ship of this magnitude. The novels, like any other non-game/”mainline” medium, will always struggle with certain challenges, and our desire is to hopefully always leverage the strengths of the medium to tell amazing stories that enrich the universe for those who choose to dive into them. It’s always a crazy balance – you want to simultaneously reward the investment of players and fans like yourself and many others who devour the extended universe, while also not alienating the admittedly majority of players who don’t necessarily go out and grab every bit of Halo media there is (as weird as that is to imagine!). And it’s also in the stories we choose to tell – like with comics we’ve said before what a weird challenge it can be even among lore-focused fans. But if we do something too big it can lead to a “Why the hell was this in a comic and not a game? !” situation lol. It’s a super tough balance to strike, but I’d love to think that with recent entries like Rise of Atriox and Collateral Damage that they have struck a better balance than maybe some previous entries had. And even when you think about past entries that met some specific hurdles, like Escalation, sometimes it’s a tough spot, where you originally wanted to tell a story like a ‘Season 2’ of Spartan Ops in a game, but suddenly that doesn’t become a viable option – do you pivot and try to tell the story in a different medium? Do you just not tell the story because you might not be able to realize it in the way you intended? It’s a tough call either way for sure, but at the end of the day, I know folks here want badly to tell compelling stories in the best way possible, and hopefully have them adored by the community as much as we do. You’re stuck on a glassed planet (sorry!) and only three Halo novels have survived for you to read. Which ones are they and why? Um… Bear’s Forerunner Trilogy (I get to count them as one, so shut it), Halo: Evolutions, and Halo: Renegades. Other than that I’d probably just spend my time trying to fix all the bad records in a new Canon Fodder issue. Gotta ask for games as well! There’s enough power on this glassed planet for a playthrough of three Halo games. Same question as above. Halo 2: Anniversary, Halo 3: ODST, and Halo 4 – assuming we are talking primarily about campaigns. 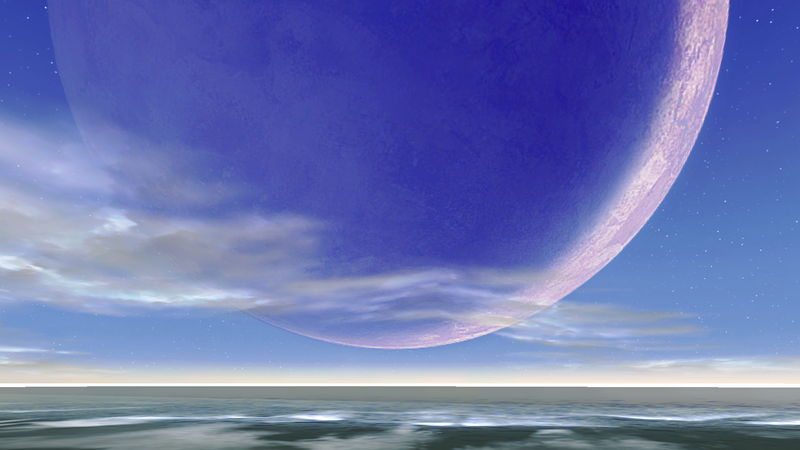 In a surprise twist, you’re not alone on this glassed planet – there’s one other person with you. Who’s suiting up with a set of MJOLNIR armour on the couch for co-op? Since MJOLNIR is made to fit someone over seven feet tall, I’m going to say that my fiancée and daughter somehow figured out a way to both fit inside, stackable Muppet-style. What are some of the upcoming projects in the near-future that you’re particularly excited about? Can you give us any hints about what to expect from them? I’ve already hinted at one of them, actually – you aren’t quite ready for Halo: Renegades by Kelly Gay. 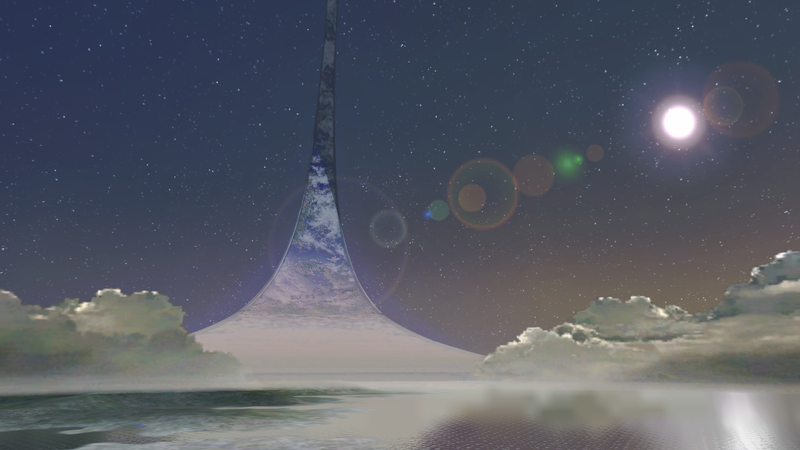 And I’d be remiss if I didn’t mention Halo Infinite – and no, I can’t really hint towards anything in it other than whatever you are probably imagining is likely wrong. Just kidding, have I ever really turned down a chance to talk more?! In all seriousness, huge congratulations on your creative milestone. Community haunts like yours have a much bigger positive effect on the Halo universe than you can possibly imagine. The passion that pours through the prose from folks like yourself is inspiring to not just other fans, but also to those of us on the “other side” of the proverbial fence. 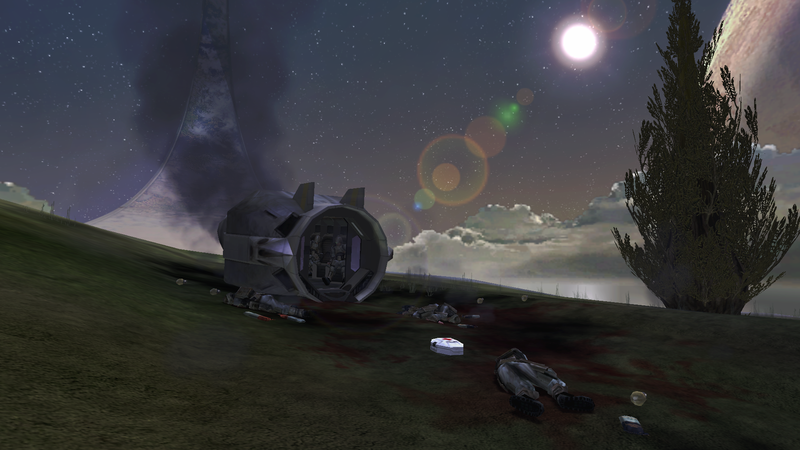 Here’s to another five long years – hopefully ones with plenty more fun Halo things to write about! It’s been a pretty mad half-decade. These have been the formative years of my adult life… throughout it all, I’ve had the comfort of writing this blog to keep me going and an audience willing to listen. As I’ve said, and will always say, thank you. Whatever form your support has taken, I’m endlessly grateful for it. Until then, go and play Halo 1 with the Blind Skull on for a new way to witness the damn-near timeless beauty of that incredible game’s aesthetic! Hey! Just found this blog while perusing Reddit. Look foward to catching up on what you’ve done the last 5 years! Thanks very much, Erik! I hope you find my articles enjoyable reads (you may need to set aside some time for most of them, they’re… really quite long lol). Good stuff man & congrats on the 5years!!! Has it been that long? Such great insight you have provided over the years and I look forward to many more to come.